I really don't know what I think about this. The core of most romance fiction is fantasy. So does it really make sense to have a series of romance novels based on true stories. 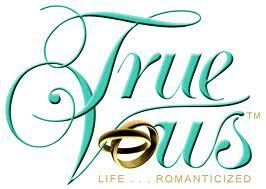 Because that is the concept behind "True Vows" a romance line from the publishers of the "Chicken Soup for..." books. What little I have seen of the couples the stories are based on (example here)... well, I don't like them all that much. The feel more like glib, privileged self-promoters than the chance subjects of heart warming life-experiences. Also the contrast between the book covers and real people is jarring. So I am left thinking, what is real here, what is not? Life... romanticised, or Frey-style exaggerated? "When fantasy meets reality anything can happen. Believe it. It’s true" the copy says, But it's a novel, so part of it... um, are made up. I just can't get that to make sense or feel appealing. Do I have to turn in my Gen-X card? I care what is true and what is not, and I want to know which is which. Sorry. When I tried to learn more about the couples on the publisher website I got the dreaded 404 error. Personally I think this line is made of WTF and will crash and burn, but perhaps I am just not much of a romantic. Just guessing here - but I think they've seen a possible gap. Dorchester owned what became known as "The Trues," all those magazines that started with "True," and we all know what happened to Dorch recently, so is this a way of reviving the True lines? I suspect you are right about the genesis of the idea. But there is a big difference between a short description of a real love story, and a 'novelisation'.